We're more than just a flooring company. We're a company that makes buying and installing floors easy. A flooring company that makes buying and installing flooring easy. At Flooring Pros, we proudly offer our products and services to both commercial and residential property owners. Let our designers help you tailor a flooring to fit your individual needs. We offer a vast assortment of modern patterns and designs so that you can choose from hundreds of hardwood, carpet, tile, and laminate flooring to achieve the fresh look you desire. Whether you want new floors to help resell your house, repair or renovate we will make upgrading your floors easy. Every house is different. Let our consultants help you make your floors standout. Our team of experts will make your new flooring project hassle-free. Purchased your floors from somewhere else? We’ll install them too! Already purchased your flooring, but not sure who to call to install? Call us! We will install flooring regardless of where you purchased from. We offer a one-year installation warranty to give you peace of mind. Do you need flooring for multiple buildings? Office? Or more? We work with contractors, builders, developers, renovation companies, insurance companies, restoration companies. Our reliable and dependable team of professionals will help make your project run smoothly. Buying a long-term investment like flooring can be challenging. Don’t worry. We’ve got you covered. When you work with Flooring Pros, you are working with the best. We’ll install your floors even if you’ve purchased them from somewhere else. Our prices are highly competitive. If you find your floor at a lower price, we will try to provide you with a better price. We focus on excellent customer service and quality flooring to give you a hassle-free flooring experience. With any of our flooring, we offer a one-year warranty to make sure you are happy with your purchase. At Flooring Pros we are dedicated to providing our customers with quality craftsmanship and a service you can trust in. Our collection offers a variety of flooring options to serve each of our client’s unique tastes and budget. You’ll work with a team of experts to hand-select the perfect product based your individual or commercial needs. No matter how big or small the project, our goal is to make the job easy and hassle-free. When you choose Flooring Pros, you choose to invest in quality and long-term satisfaction. Contact us online or give us a call today for a free estimate. Don’t worry. We keep your information safe. Want financing for your next flooring project? 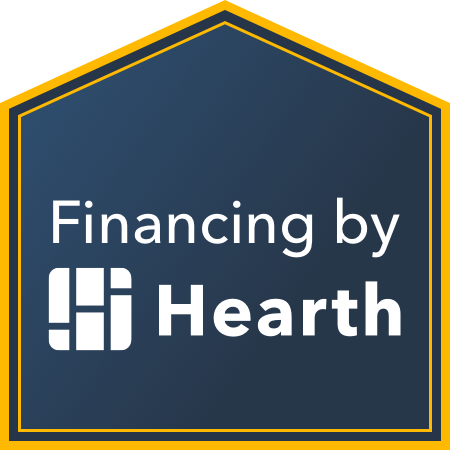 We are partnered with Hearth to help you get your flooring project financed as smoothly as possible. Check out financing options by clicking on the house or here.